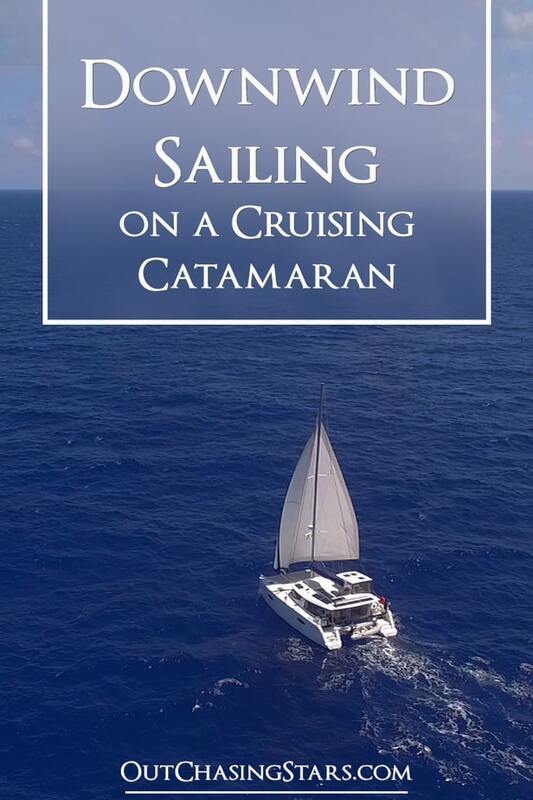 When we wrote our first sail trim for a cruising catamaran blog post, we were just about to move aboard Starry Horizons for our circumnavigation. We’d been sailing a 30-foot Maine Cat around Galveston Bay, getting some sailing experience under our belts. Starry Horizons is a pretty big leap, and we’ve learned a lot about sail handling since then. There are two advanced sailing techniques that we’ve found very helpful when sailing deep downwind in under 15 knots of apparent wind speed (AWS). Our screecher is our favorite sail to use, as it’s huge and when the wind is just right (like on the beam) we really get flying. 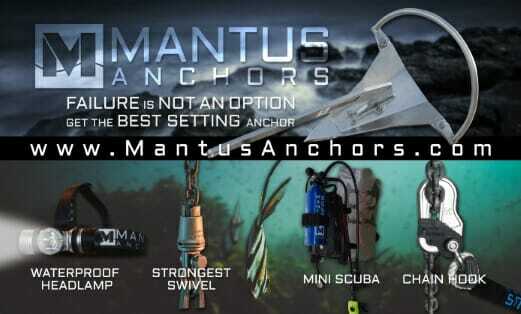 The screecher is best used with an AWS of fewer than 15 knots, with an apparent wind angle (AWA) of fewer than 135 degrees. We have sailed several times with the tack of our screecher (or spinnaker) attached to the windward bow of the boat instead of being attached to the bowsprit. This allows us to sail at a deeper downwind angle (135 – 160), simply because instead of approximately 12 lateral feet between the tack and the clew (half the width of the boat), we are now using the full width of the boat to open the headsail even wider. While the sail is still furled, we use a soft shackle to attach a frictionless ring to the bow cleat. Through the frictionless ring, we run a new tack line. The bitter end of the tack line goes through the clutch on the toe rail. We loosen the clutch on the bowsprit to free the normal tack line, detach it, and pull the tack of the sail over to the new tack line. You can keep both tack lines attached, and actually adjust the position of the tack: to the frictionless ring at the bow, to the bowsprit, or somewhere in between. We have sailed several times, especially on our Atlantic crossing, with our headsail and mainsail set to a wing-on-wing configuration. It works, but can be troublesome depending on how light the wind is or how much the swell conditions are knocking the boat around. Instead, we’ve flown wing-on-wing with both our screecher and geneoa out. The two sails combine to create one giant sail, and the wind funnels from one sail to another. This is much more forgiving than sailing wing on wing with the head sail and main sail. Wing-on-wing in the Pacific Ocean. Wing-on-wing with two headsails. Gorgeous! The tack of the dual headsail set up. As the screecher is not a sail that you can furl, when the apparent wind speed is higher than 15 knots, we sail wing on wing with the genoa and mainsail. Both sails can be reefed as the wind picks up. As you may know, David and I don’t have much experience on monohulls at all. From what we gather, monohulls are not as comfortable downwave as catamarans are, which is a bummer for a downwind circumnavigation. However, when they do go downwind, we have several friend boats who sail wing on wing with the two headsails. Putting poles on the clew of the sail to spread them out would be required. When sailing with finicky sail configurations like the ones above, be sure to put your autopilot on wind vane mode and set the wind angle as a priority. That way, if the wind shifts, your autopilot will adjust the boat to have the sails properly filled. If you are running on a heading or a track when the wind shifts, you might find your sails backwinded or do an accidental gibe (which is dangerous). Being on the wind vane setting does mean that you need to pay extra attention to your course; if the wind shifts, you may have to switch t another downwind sail tactic. What have you found that works best for you while downwind sailing? Super useful stuff here. Much appreciated. Amy, I’m In Galveston. Never moved after school. Always Ship work between Houston and NOLA. I’m scheduled for a charter around September in St Lucia on A Helia44. Three cabin configuration. Looking forward to it. Great! I hope you have a great time, St Lucia is lovely! Of course I made a bonehead move and called David ‘Frank’ .. ? Last night I was google-ing Catamaran Sail Trim for our Gemini 105MC (same as Dave Hedgepeth) when I found your blog. Then copied your ‘About’ link and sent it to work (I am West Marine Rig Shop mgr in Kemah, TX) to read about ya’ll when I had time. 2nd sentence re: Capt Amy: “Grandfather started State Boat and Father started Star Fleet in Kemah, TX” … OMG … Amy is Tom Lober’s daughter! Your Dad and I were classmate at TAMUG on Pelican Island 77-82. He would be SO Proud of both of you!! Donna Cuddy (my girlfriend and also a classmate of your Dad) bought a Gemini 105MC just like Dave Hedgepeth. Ours is in Deltaville, VA where we will explore Chesapeake Bay. Thank you for the Adventure you are Sharing!! Hey Franklin! What a small world! I think of Dad all the time while cruising, he would have loved to join us. I’m very familiar with that West Marine! 🙂 PS don’t worry about calling David Frank! Amy, I have shared your Adventure with fellow classmates, Karl Haupt, Ed Bishop and Jim Brown. We are all very Impressed! Please tell your MOM hello! I did pass along your hello! Wonderful to hear from Dad’s old classmates! Amy, I went to school with you Dad. TMA’80. Another classmate sent me the link. I own a Gemini 105Mc so this info is great. My boss owns a Helia 44 in a charter fleet in Grenada. Glad you are having a good time. Hi Dave, thanks for reaching out, I’m glad you have found the post helpful. Where are you located? We love this approach too. Much more stable than the traditional wing on wing.